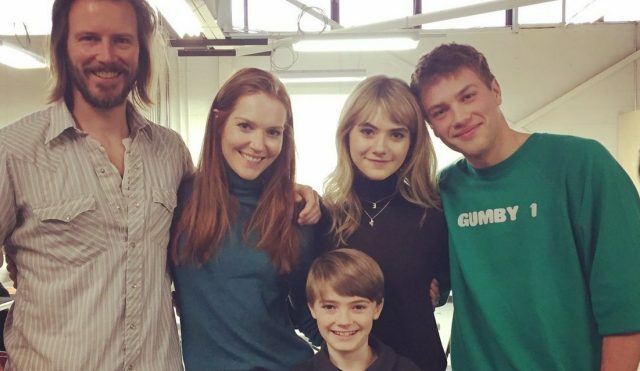 Locke & Key star Darby Stanchfield took to Twitter to reveal a behind-the-scenes photo from the first table read of the Netflix series, offering our first look at the Locke family together. Check out the full photo below! Locke & Key is a horror/fantasy series that revolves around three siblings who, after the gruesome murder of their father, move to their ancestral home in Massachusetts only to find the house has magical keys that give them a vast array of powers and abilities. Little do they know, a devious demon also wants the keys, and will stop at nothing to attain them. The series will star Connor Jessup (American Crime) as Tyler Locke, Emilia Jones (Utopia) as Kinsey Locke, Jackson Robert Scott (It) as Bode Locke, Sherri Saum (How to Get Away with Murder) as Ellie Whedon, Darby Stanchfield as Nina Locke, Griffin Gluck as Gabe, Laysla De Oliveira as Dodge, Petrice Jones as Scot, Thomas Mitchell Barnet as Sam Lesser, Steven Williams as Joe Ridgeway, Kevin Alves as Javi and Asha Bromfield as Zadie. The IDW Publishing Locke & Key comic book franchise, co-created by Joe Hill and Gabriel Rodriguez, has garnered both awards and acclaim during its ten-year run; has been translated into dozens of languages across the globe; and has sold millions of copies worldwide. Meredith Averill (The Good Wife) will co-showrun the series with Carlton Cuse. Cuse and series co-creator Joe Hill (the son of Stephen King) co-write the first episode with Aron Eli Coleite. Lindsey Springer for Cuse’s production company Genre Arts will executive produce alongside David Alpert and Rick Jacobs of Circle of Confusion. Andy and Barbara Muschietti (IT, Mama) will executive produce alongside Ted Adams and David Ozer from IDW Entertainment. The post Meet the Locke Family in New Locke & Key BTS Photo appeared first on ComingSoon.net.